- Doug telling Phil that he's given his number to the Estate Agent for the sale of Number 28. - Detective Illich watching from a distance as Phil cries and begs a comatose Julie for forgiveness as she is dying in hospital. A taxi pulls up outside Number 26. Michael and Danni emerge, and they both look up at the house, where the curtains are drawn. DANNI: So... I wonder how they're going? Michael warns Danni that the family will need his support, and suggests that he goes in alone. She watches as he marches up the drive. Debbie is lying on the sofa. Michael enters, but Debbie doesn't look up until he speaks. She apologises, saying she was miles away. DEBBIE: She's in intensive care. MICHAEL: But she's going to make it through, isn't she? DEBBIE: ...it doesn't look good. Michael asks where Phil is - apparently he's been at the hospital ever since she was admitted. Michael goes to see him, and asks Debbie along. MICHAEL: Things must be pretty heavy over there? She turns away from Michael and sits back on the sofa, clutching a cushion. DEBBIE: I couldn't handle seeing her like that. MICHAEL: Deb, you have to. What if she doesn't pull through? DEBBIE: Yeah, well... You know what doctors are like, they're always so negative. She'll be back home again, driving us crazy before you know it, you'll see. 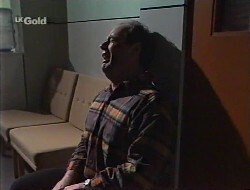 Michael sits down opposite Debbie. MICHAEL: You remember what it was like when Mum died? We never got the chance to say goodbye to her. You don't want that to happen again, do you? MICHAEL: If it does, you will never forgive yourself. DEBBIE: Michael, I'm sorry, but I just can't do it. Danni is making a fuss of Lolly. Cheryl asks if she had a good time away, and Danni said that she did - up until Michael received the call about Julie's accident. 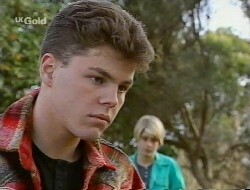 Brett tells Danni that Cheryl was the one who found Julie. Danni sympathises and Cheryl says that it was awful. Cheryl asks how the Martins are bearing up and Danni lies, saying that Michael asked her to go home with him, but she thought it would be best to leave them alone. Cheryl says that her trip wasn't much of a holiday, and Danni says it's true, but she feels guilty thinking about herself at a time like this. CHERYL: Oh, I know what you mean. I've been feeling guilty too. CHERYL: Well, I had so many ill thoughts about Julie and then this happens. CHERYL: Don't wish too hard for what you want, because it might come true. You remember that. 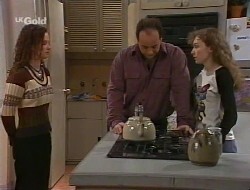 Danni and Brett try to reassure her, but Cheryl still feels bad. They offer her support - apart from hoovering, washing up and ironing! They all laugh. Phil is still holding Julie's hand. Her vitals haven't changed. Michael walks in and tearfully, Phil hugs him, not letting go of Julie's hand. Michael warns that Debbie is depressed and Helen is busy looking after Hannah. Phil says he hasn't been much help with the family, but Michael tells him he's needed by Julie's bedside. MICHAEL: Is there any improvement? PHIL: She's got brain damage, mate. I keep hoping... There's so much I've got to talk to her about. I can't believe how hard I've been on her lately. MICHAEL: I was too, don't forget. PHIL: I've been trying to prove some stupid point. MICHAEL: Does anyone know how it happened? PHIL: I'll never forgive myself if she doesn't pull through. PHIL: I can't remember the last time that I told her that I loved her. Mark is showing Rick holiday photographs. Rick compliments the scenery, but Mark is more interested in Annalise! Rick laughs and tells him that he's got it bad. Mark corrects him - he's got it good, he's in love with the most beautiful woman in the world and she's in love with him. Mark tells Rick he's going to ask Annalise to move back in. Rick isn't keen - not because he doesn't like Annalise, but he doesn't want to be caught in the crossfire like last time. Mark swears it'll be different this time around. Rick warns him that Ren won't be pleased - it's too small a house for 4 people to share. Mark says that the trip to France taught him one thing - he can't live without Annalise. Rick reckons that she'll be getting on his nerves before he knows it - and gives them one week tops before they're getting on each other's nerves again. It's late at night, but Phil is still holding Julie's hand. A nurse is checking the drips and suddenly, Julie's vitals drop. The nurse buzzes for help and asks Phil to leave. PHIL: Oh God, no! Julie? Julie, listen to me. The hospital staff pull him away from the bed. PHIL: You gotta save her! Julie! Julie? Oh please, no! They bundle him into the darkened, empty corridor. He leans back against the wall and starts to sob. 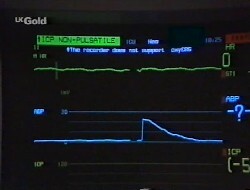 The scene cuts between the hospital staff using a defibrillator and Phil sliding down the wall of the corridor. PHIL: Please, God, don't let this happen. No. No. Please. Phil hears it and yells in anguish. Rick is going ice-skating with Cody later on. Mark has a letter from Alan Crowley. Rick dubs him 'Creepy Crowley' and reckons that he's the nastiest piece of work on the planet. Crowley wants to speak to Mark as soon as possible. Cheryl has popped over. Annalise wants to know when she starts back at the Waterhole. Cheryl says she doesn't need her anymore - she had problems in Annalise's absence, and explains the trouble with Marlene running the place, so she's taken back the helm. Annalise frets that she didn't do the job well enough, as she thought Cheryl wanted to stay home with Lolly but Cheryl tells her that she can't breastfeed anymore and she's got back into the swing of working. CHERYL: I guess it's in my blood. Cheryl laughs, and says that with Ren looking after Lolly, everything's fine. She says it's still hard to be apart from Lolly - and Annalise says she feels the same way about Mark! Annalise isn't too bothered about the job, as it means she can spend more time with him! Marlene comes in and coos over Lolly. The three women make a fuss of how gorgeous she is and Cheryl admits that she's thinking of running a baby competition at the Waterhole. Cheryl and Marlene tease Annalise over Mark. Phil is in the kitchen and looks absolutely gutted. Debbie apologises, and says she should've gone to the hospital. Phil tells her she couldn't have done anything. He didn't sleep at all, and Debbie suggests that he get some now - but he doesn't think it'll help. Michael is listening in and comes over - he thinks Phil should rest too. Phil says there's too much to do - he needs to phone relatives and organise the funeral. Michael tells him that he's already rung around, and Helen suggested that they stay with the people who did Jim's funeral, so he's rung them too and they'll take care of everything. Debbie and Michael send him off to get some rest, and Phil is grateful - he doesn't think he could cope with it all himself. Danni cheerfully knocks at the back door and asks after Julie. Phil turns away, clearly upset and Debbie tries to comfort him. Michael looks sombre. Danni apologises and offers any help they need and Michael thanks her. Neither Phil nor Debbie speak. She leaves. Cody is walking up to Number 26 and bumps into Danni as she's coming out. CODY: Any word on Julie? DANNI: Um. She, she died last night. Cody is stunned. Danni tells her that she thinks Julie didn't regain consciousness at all after the accident. Cody thinks she should go in and offer her condolences but Danni tells her to leave it for a while. Cody asks after Danni, and invites her ice-skating with Rick. Danni thanks her but refuses. Cody looks over and sees a man looking through the windows of Number 28. Of course, he's just "a man" to Cody but we know him better as Karl Kennedy. She approaches him. CODY: Excuse me? Are you thinking of buying this house? KARL: I could be in the market, yes. CODY: It's a great house, I used to live here. KARL: Huh. I'll keep your recommendation in mind. KARL: It's all right. Apparently Mr Philip Martin has the keys? He lives at Number 26, I believe? CODY: Yeah, he does but it's not a good time to over there. CODY: There's been a death in the family. Karl looks even more irritated! KARL: You don't have any keys, do you? CODY: No, no, I don't but I can get them off him and give you a call, if you want. KARL: It's a bit inconvenient. Perhaps I should just forget the whole thing. CODY: It'd be a shame. It's a great house. KARL: Hmmm. So you've said! CODY: Do you want me to get the keys or not? KARL: Yes, all right. You can reach me on that number there. Karl gives her his card. Karl gives her a stern look. KARL: If you get the keys, I'll take a look. But if you don't, well, more fish in the sea and all that. He smugly walks away. Cody mutters to herself. CODY: You'd be no great loss, mate. Annalise is enthusiastic about getting the push from the Waterhole - she tells Mark it means that they can spend longer working side by side in the Coffee Shop and really push it forward. Mark isn't too enthusiastic - he's still thinking about the meeting with Crowley. Annalise asks how it went. It turns out Mark has been offered his head chef position back at the restaurant. Annalise is amazed at Crowley's nerve and asks Mark if he told Crowley where to stick it. Mark doesn't say anything - and it's clear he's taken the job. Annalise is annoyed and disappointed - so much for her plans for the Coffee Shop! Phil is sitting in the living room alone. Michael walks in with a cup of soup. Phil refuses it, saying he has no appetite. Michael tells him that you don't need an appetite for soup and makes him take it. Michael sits opposite him and tries to joke about his less than enthusiastic response, but Phil isn't in the mood for humour. Phil is tearful all the way through their conversation. PHIL: I can't stop thinking about it. The past few weeks, I made Julie's life absolute hell. MICHAEL: The way I hear it, it was the other way around. PHIL: If she'd been happy at the end, maybe it'd be easier to accept. I dunno. The last thing I did with Julie was argue with her. Why couldn't I have just told her that I loved her? Was that too much to ask? Michael sits next to him on the sofa. Phil drops his voice to a whisper. PHIL: The thing that keeps playing on my mind...is whether she actually killed herself. MICHAEL: No way. Not Julie. PHIL: But if she did, I'd be to blame. I'd have driven her to it. MICHAEL: Look, nobody knows what happened. Maybe we never will. PHIL: How do we know she didn't kill herself? MICHAEL: It was an accident. It had to be. PHIL: Oh, Michael. I hope so. You can't believe how much. Oh, listen to me! How selfish is that? I needed to get myself off the hook. MICHAEL: Dad, you've got to stop torturing yourself. PHIL: Can you give me one good reason why I should? Annalise is not happy. Mark wishes that she could be pleased for him - it was too good to turn down. Apparently standards have dropped since he left, and Crowley needs him to turn the place around. Mark says that he's on more money - and Annalise scoffs that Crowley bought him for 30 pieces of silver. Mark tells her it was more than that! Mark tells Annalise that he was trained as a chef and it's what he loves doing. Annalise is sulky and says that she thought that he loved her. He insists that he does. She thinks that they should be together more. He suggests that they move in together again. Annalise is immediately cheered! Michael is sitting alone. Danni approaches him from behind. Michael doesn't turn around to acknowledge her. She asks if he's ok and he just shrugs. She sits down with him. DANNI: I haven't seen much of you since you got back. DANNI: What I meant was um, if there's anything I can do, just ask. He pauses, and eventually opens up. MICHAEL: Things are pretty rough at the moment. Dad's in a really bad way. DANNI: Yeah, I can imagine. MICHAEL: I'm trying to be strong for him. And everybody else. But I just had to get out of there for a while. It was all getting a bit too much for me. DANNI: You poor thing. Listen, why don't I take you down to the Coffee Shop and we'll get a smoothie or something? DANNI: Y'know, whatever. You know what I mean. For the first time, Michael turns to look at her - and he looks pretty gobsmacked. MICHAEL: Danni, I don't think you realise how serious this is! MICHAEL: My family needs me! All you can think about is...smoothies! MICHAEL: Look, I haven't got time for this, ok? I need to get home. Michael stalks off. Danni looks a bit shellshocked. Rick and Cody come home. Marlene asks how the ice-skating went, but Rick and Cody are both sombre - it's hard to be enthusiastic about anything. MARLENE: It's tragic. Young mother in the prime of life. Cody wants to go over to see the family and to offer her support to Debbie, but Rick is reluctant. Cody pushes the issue, saying she wouldn't want her friends to stay away, but Rick doesn't know what they'd say. Marlene can see both sides and suggests sending a sympathy card, but Cody thinks it's a cop out. Marlene is impressed with Cody's determination. Phil and Debbie are standing together. Cody is offering her sympathy. They thank her, and Phil tells her there's not much anyone can do. The phone goes and Debbie goes to answer it. Cody tells Phil about Karl and how she warned him off from coming over. He thanks her and agrees to give her the keys to Number 28. Phil comes in to get the keys and Debbie is on the phone. She puts the phone down and Phil guesses something's wrong. DEBBIE: The doctor can't sign the death certificate. We, we can't go ahead with the funeral. DEBBIE: Apparently the police want to do an autopsy. They need to find out the exact cause of death.